On Monday I took a short road trip to Edenvale to order my new cupcake stands – promise to post these in my next couple of posts. While I was there I visited the Chocolate Den in Edenvale and this was a blast from the past for me as it was my most frequented shops about 15 years ago when I was making and selling chocolate lollies. It was brilliant to be back in their newly revamped shop, yet another Aladdin’s Cave for me! On my to-do list for 2012 is to explore different flavours for my cupcakes and I was so pleased to see that the Chocolate Den had a range of different and yummy smelling flavourings. Needless to say a few of these somehow made their way into my shopping basket and I couldn’t wait to try them out. 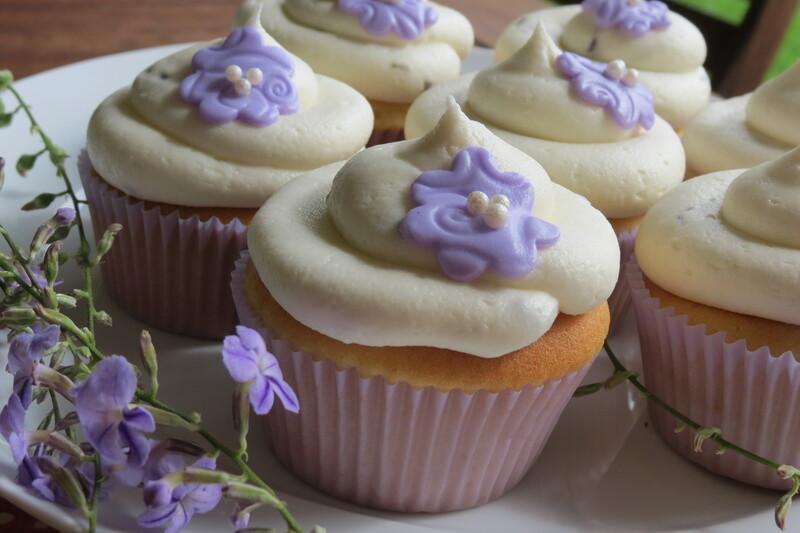 I baked these lavender cupcakes for our first day back at scrapping at the Memory Shed and the girls were happy to be my tasters once again and everyone agreed that these cupcakes were really tasty. 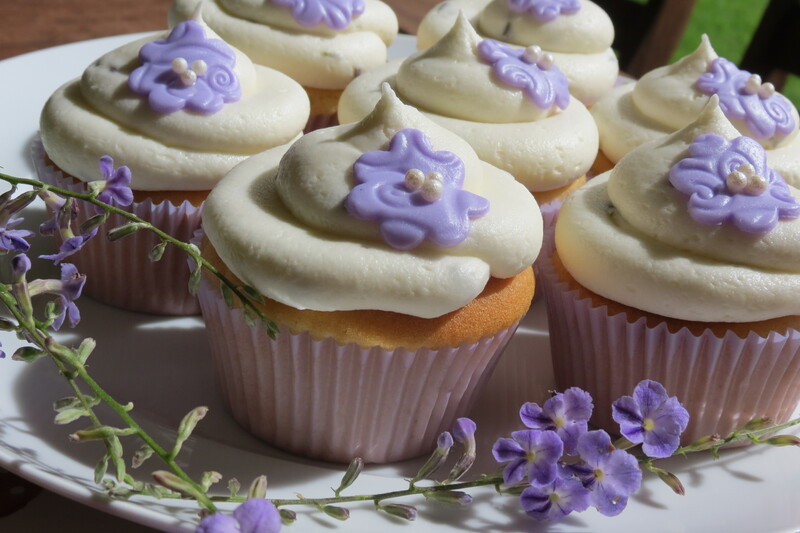 They had a subtle taste of lavender in the cupcakes itself and then a creamy lavender taste in the icing as I added lavender petals to the icing. I made pretty lavender coloured sugar paste flowers as cupcake toppers. They are so pretty Lisa and they really tasted divine. Love how the topping looks marshmallowey, I kept prodding the top of mine. Geez, so now they look good, taste good,smell good and FEEL good. Well done again, and thanks for bringing my very favourite coffee ones on Friday, I love having you in my life! Thanks Michelle, I was so excited about my new lavender cupcakes and loved it that everyone was so positive about trying new flavoured cupcakes. Glad you loved your coffee cupcakes and it is a privilege to have beautiful friends to bake for! Shayna was kind enough to share a Lavender cupcake with me, wow!! what a taste sensation, just loved it, can’t wait to try out your next cupcake creation!! Thanks to Shayna for sharing and thanks Marco for your comment. I am delighted you were excited about my lavender cupcakes as I know your favourite are the chocolate cupcakes. I will definitely be experimenting with other flavours and honest tasters are always needed to try out new cupcakes! Thanks Lisa, and we know that guinea has excellent taste as firstly she hangs around with you most of the day, secondly she loves our Wednesday class and thirdly she loves my cupcakes!